Lack of good, deep sleep has made a mess of me this week: Aidan is up at night talking talking talking to himself. Sometime giggling, sometimes muttering, sometimes signing and repeating movie scripts. He had a fit on Wednesday, a day that LAUSD had off due to Yom Kippur (sorry to my Jewish friends for not knowing this ahead of time!) 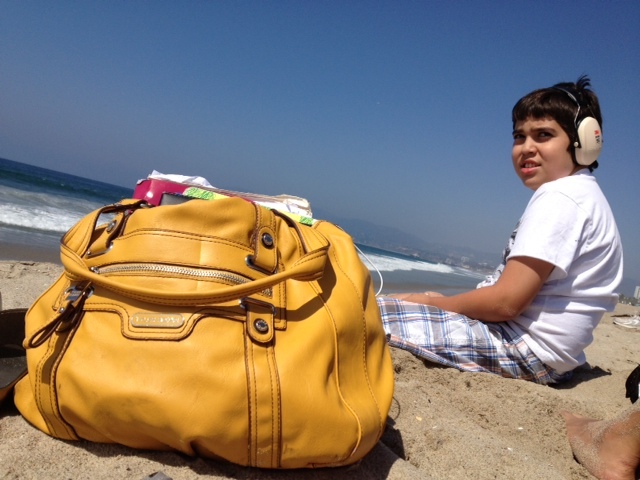 and I took him to the beach in Venice for a Mommy and Me brunch. Except when his menu fell on the ground he started screaming bloody murder and I looked like a fool saying “Oh it’s okay! Sometimes menus fall on the ground! What can we do when menus fall on the ground?” when really I wanted to spank him with a chancla. The entire restaurant stopped and stared, I dragged him out to the water thinking that he would calm down. He didn’t, and threw a 20-30 minute fit, screaming and such. It was then that I regretted not having a mimosa at brunch. I also had to walk him just 2 blocks down the street on Wednesday to pick up my laptop, because the mic had to be fixed for my interview on Huffington Post Live (on IEPs and the broken special ed system for kids with disabilities). Except Aidan cried all the way down the street and if you don’t know that the autistic nature of repeating things incessantly can be torture, you are extremely lucky. “OH NO! ARE THE BIRDS CHIRPING?” “OH NO, ARE YOU SAD?” “OH NO, THE ANTS”–then repeated in that sequence, for about 8-900 times. But it was still better than the fit he had at the park last week with his attendant and trainer, where he tried to body slam them and head bang into the concrete. They didn’t want to force him to go to the car because it would have looked like they were trying to kidnap him. People usually know he belongs to me, though I am not sure if that’s good or bad? He got off the bus crying yesterday. The TA said that he had yelled “Chirping!” very loudly then cried on and off all the way home. Beyond these episodes it’s been the typical week: IEPs to review and work on, client agreements to settle on, conference calls, one of my sitters is in the hospital with leukemia and I yelled at the director of the South L.A. Regional Center about her case (looks like she will finally get some nursing care for her 20 year old with disabilities though), and Aidan has his own appeal going. Same old. I do feel bad that I tried very hard to stay awake to meet my husband last night, he took a standby flight from Seattle to be home early with us, but I of course fell asleep on top of our bedspread, drooling all over myself. I did get about 30 minutes of good sleep in. Sweet relief. One of my best friends called me this morning from New Orleans, an attorney, on her way to a hearing. I picked up the phone by asking her to commit me to a mental institution. She replied that it has to be my husband. I said he was too busy working and then reviewed my life with her and asked where it had gone wrong–was it getting married at 20? Was it getting married to my ex-husband? Was it having a child? She laughed and said it was most likely that I’d had a child with a disability. I told her to look at the homeless men walking up and down Bourbon Street (or would it be Canal Street?) talking to themselves with no disability/mental health services and remember that I am trying to keep my son from this fate. This too shall pass. My ex-husband must have even thought I was a little off after he texted about Aidan’s morning because even he started sending me Care.com postings to review for backup sitters. So I decided to spend my day drinking a lot of coffee to counter my exhaustion. FYI it worked–ended up picking up the boy EARLY from school as a treat. I’m a glutton for punishment. Love this kid, even if I feel like I’ve had an infant for 13 years. Previous post ← Who is Aidan’s mystery friend?? ?